KUALA LUMPUR: To Malaysia-born martial artist Ev Ting, Chinese New Year is an occasion he looks forward to every year. It is the time of the year when he bonds with his loved ones in Kuala Lumpur, Sarawak, and even Auckland, New Zealand — whether it is just eating, visiting, or engaging in fun and games. “There are four ‘must-dos’ for me during Chinese New Year. 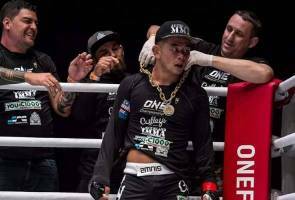 They are visiting relatives, gaining a few more kilograms, giving more than taking, and gambling,” the New Zealand-based martial artist says. As Ting welcomed the Year of the Pig, he recalled his favorite Chinese New Year moment. “It was when I spent two days in Auckland, two days in Kuala Lumpur, and a few days in Sarawak,” the 29-year-old recalls. “It was a lot of feasts and ang pows, but now I need to give them out,” he jokes. For the 2019 Chinese New Year, however, Ting’s celebration will be cut short. The determined athlete is focused on his career and, more specifically, his forthcoming ONE Lightweight World Grand Prix quarter-final match against Saygid Guseyn Arslanaliev at ONE: CALL TO GREATNESS. Set to take place on 22 February at the Singapore Indoor Stadium, fans will also witness another ONE Lightweight World Grand Prix battle between Amir Khan and Ariel “Tarzan” Sexton. That bout is important, too, as Ting will face the winner if he leaves “The Lion City” victorious. “It is nothing new for athletes or anyone ambitious to miss holidays, and grind towards their dieting and performance goals,” he explains. Although “E.T.” will miss time away from his family, he always carries his parents’ Chinese New Year advice to the cage.